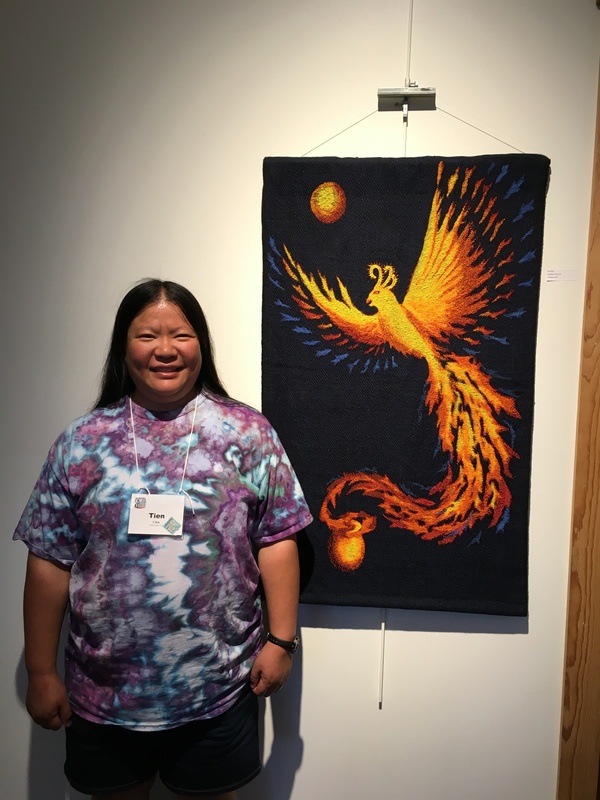 Pardon the silence, but last weekend was Complex Weavers Seminars, and oh my, what a party that was! 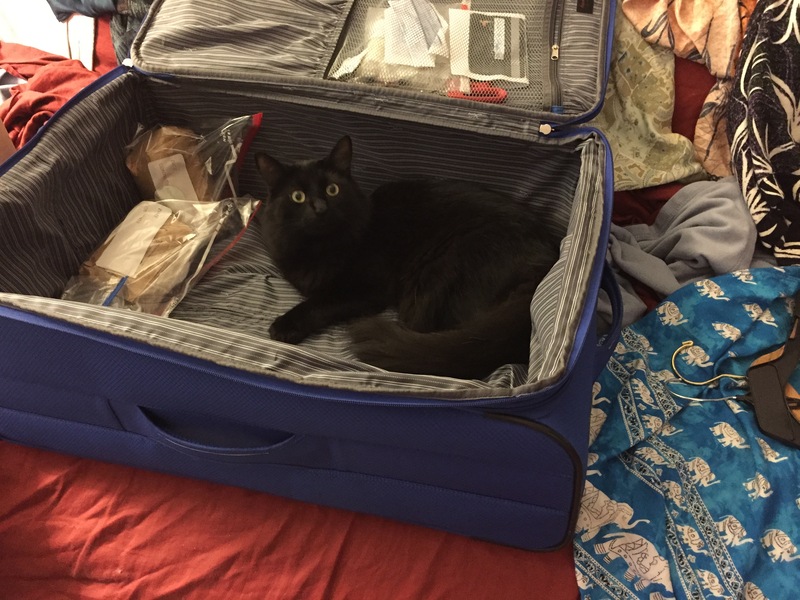 I slept only six hours a night because there were so many interesting things going on – seminars, study group meetings, social events, the Silent Auction, and of course, Complexity, Complex Weavers’ biennial juried show. Alas, no pictures were allowed, so I can’t show you the many magnificent pieces that were in the show. I will say, though, that every piece included was spectacular, and I felt very honored to have had a piece in such remarkable company. Ma, I hope I did you proud. I also gave my first-ever presentation at Complex Weavers Seminars, teaching how to construct complex weave structures in Photoshop. It went pretty well – at least, nobody threw things at me (I was careful to clear out the guns and knives in the classroom beforehand, however! ), and several people came up afterwards to tell me how interesting and useful they thought the seminar was. So that was encouraging! The seminars were, as usual, mind-bending and inspiring. My favorites were “Simple Velvet” and “Polychrome Velvet,” by Wendy Landry, who has been studying velvet for the last twenty years. I unfortunately can’t share photos of her incredible samples, because she asked us not to – but that’s great, because she’s working on a book! How exciting. I can’t wait to read it. Her seminars were the most interesting thing I’ve seen all year – now I want to try weaving velvet! Thank you to whoever suggested making the logo more horizontal, and whoever suggested using the book colors in the logo. I had been fond of the maroon and blue until I tried putting them on the same web page as the book cover – horrible clash! This color combination is just as nice, and is much more harmonious, I think. 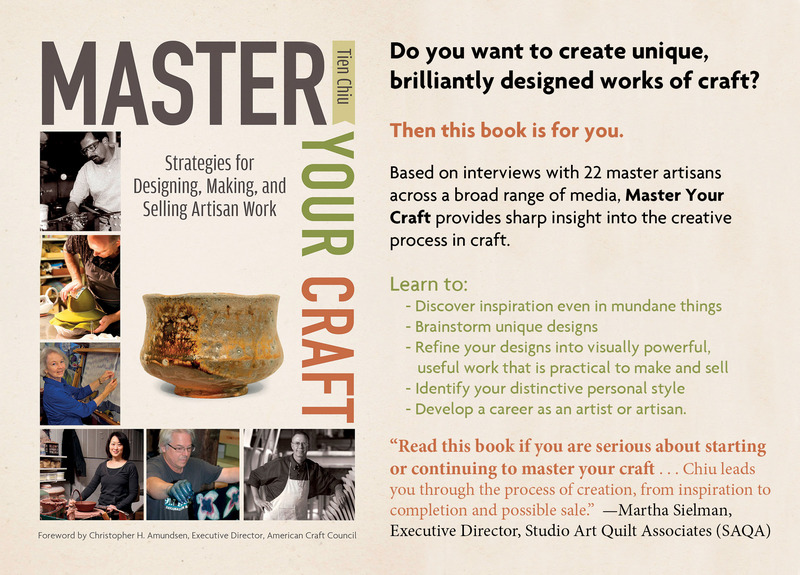 The back side (which I’m not quite ready to share yet) advertises the business I’m starting, and offers a free e-book called “Map to Mastery”, which I have yet to write. Since I have only about five weeks left before the postcards get handed out, I have to get the website going and the e-book written very, very quickly. No pressure, of course! But it has been keeping me very busy. After the passage of HB2 in North Carolina, the LGBT Center of Raleigh saw an eight-fold increase in calls to its crisis line. This included an increase in LGBT people considering hurting themselves or contemplating suicide. After Orlando, the LGBT Center of Raleigh has had to provide even more mental health care to the community. As an ally in North Carolina, I aim to do everything I can to support my LGBT siblings. Unfortunately I’m a broke grad student with little free time, so finding time to volunteer had been difficult. However, I knit every night to de-stress, and my lace knitting holds its own with the most skilled grandmothers in the state (3rd place in knitted shawls at the 2015 NC State Fair). I have a stockpile of lace shawls that I have never worn and that I have decided to auction for LGBT charities. This first piece, Midnight Bloom, took over 50 hours to knit. I would never be able to sell this for profit and recoup a reasonable wage for labor, but if it makes $100+ for the LGBT Center of Raleigh I’m happy. 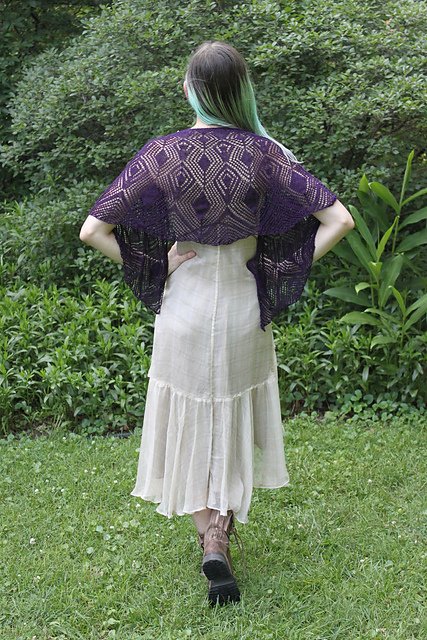 There are six days left in the eBay auction – if you want to do good and get a fabulous shawl for yourself, please go place a bid! This offered some wonderful possibilities. 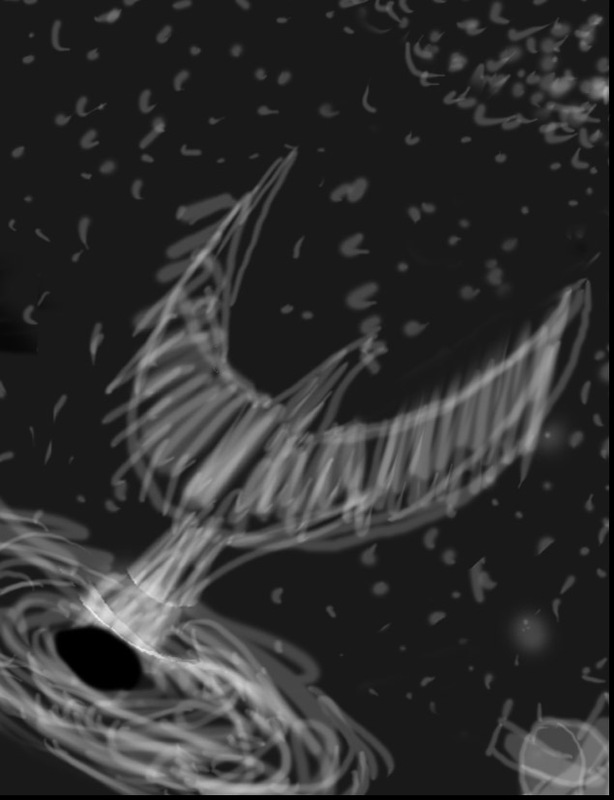 The phoenix could rise out of the blue cone of light above the black hole, and thematically it would be perfect, since a black hole is the ultimate symbol of death. 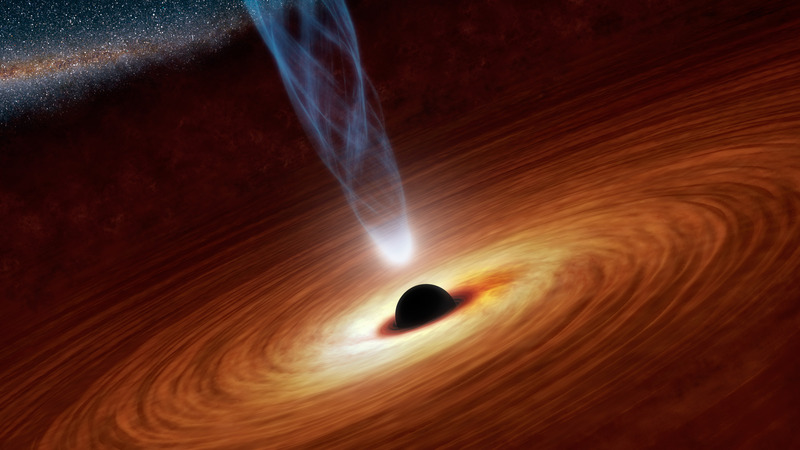 (A black hole exerts such a strong gravitational pull that nothing escapes it – not even light.) The black hole could also be a symbol of rebirth – some people have speculated that it might be an entry-point to another universe. Of course, since nothing survives the trip into/out of a black hole, we’ll never know. Here the phoenix rises out of the cone of light around the black hole, and stretches its ghostly wings towards a galaxy just visible in the top right corner. A small space probe observes it from the bottom right corner. The lines of the phoenix have tremendous drama – I can practically feel it rising up out of the void. The black hole (once it’s rendered more completely) provides a great launching pad for the phoenix but is tucked back enough into the bottom left corner that the phoenix still dominates. Having something in the foreground (in this case, the space probe) gives a sense of depth and scale that would otherwise be missing. This phoenix is the size of a solar system (at least); having a small man-made object in the foreground gives a sense of just how tiny we are in a vast universe. Focal point in this version is the black hole, as it’s the area of highest contrast. 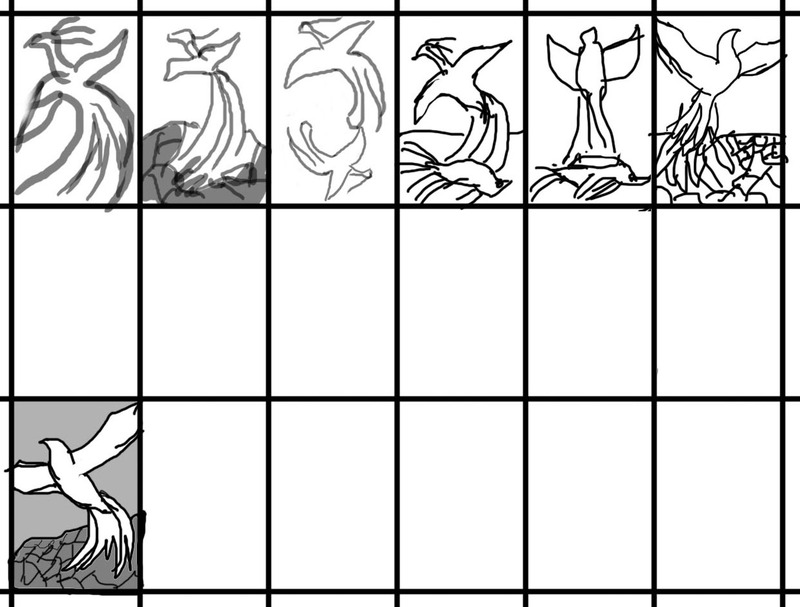 I’ll need to fix that by adding interest to the phoenix head. I think the black hole should be an important element, but not dominate. Something about the proportions and cropping of the photo feels wrong, though I haven’t yet put my finger on what. Still not certain what goes in the bottom right. I want something in the foreground to create depth and give a sense of scale; the space probe is the best so far. I tried a planet, and found that it was difficult to render the planet at the scale I wanted without creating unpleasant tangents (places where two elements are just barely touching) with the black hole. I tried a person, but people are way too interesting; it drew attention away from the rest of the composition. Spaceship didn’t work because it’s really hard to make just the front third of a spaceship look like a spaceship. Space probe seemed to work best, but I welcome more ideas! This piece still has composition problems, but conceptually I like it, so I’ll be developing it further in the next week or so. Plan is to weave it with highlights of real gold thread in the phoenix, and maybe even add some fiber optic cable to make parts of the composition glow. I might also add some beads. In which case, I’d surely need help. 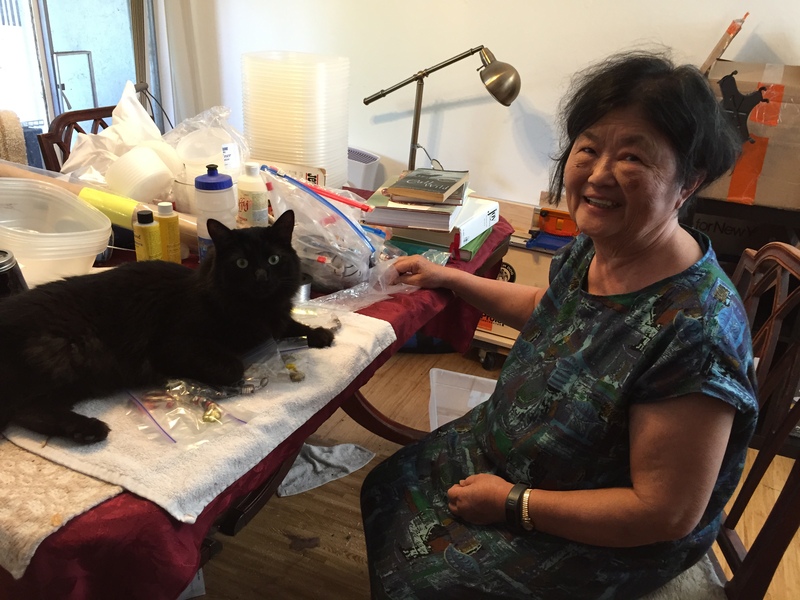 Thankfully, Fritz is ever available to assist….here is a photo of him helping my mom with her beading project, while she was visiting. I’m working up concept sketches for my next piece. 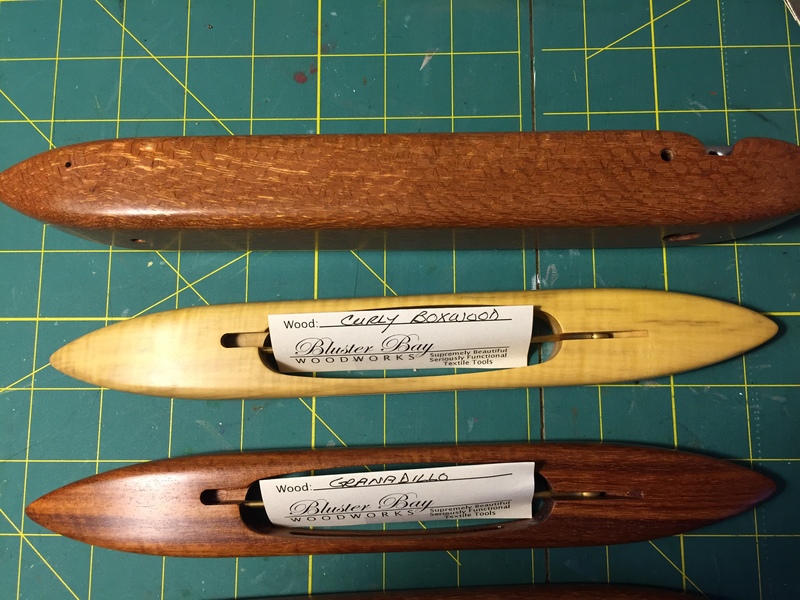 Technically, there are two pieces in queue ahead of it, but they are relatively mechanical – weaving a project directly from a photo. 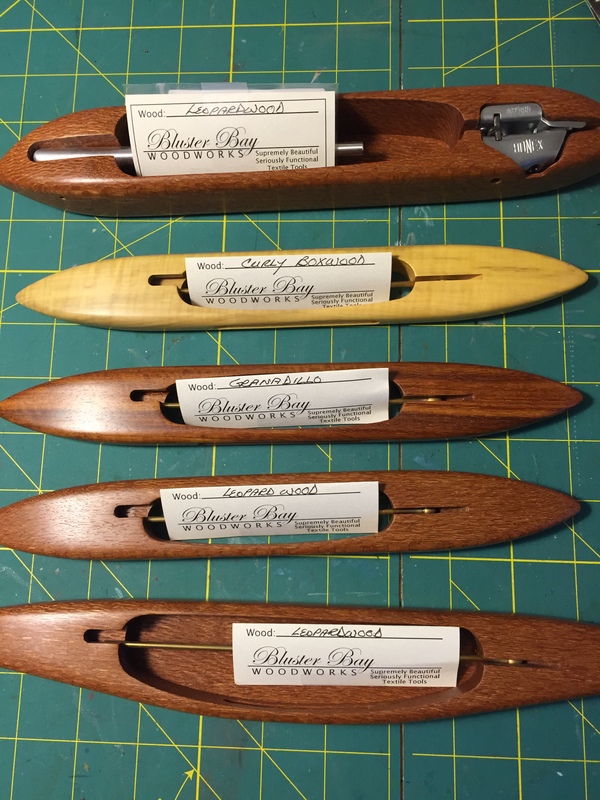 Not very original, but appropriate gifts to the people who made it possible for me to buy and weave on a jacquard loom. I wasn’t in love with any of them: the ones with phoenixes rising from lava (the cracked earth) felt hackneyed, and the ones with a dead bird at the bottom felt clumsily literal. After looking through lots of images of phoenixes on Google, I realized that it would be very difficult to do something with phoenixes rising from fire that hadn’t been done many times before. I wanted something a bit more original. Here we have a rendition of bipolar disorder: the phoenix rising on the left side symbolizes the fires of mania, the black crow descending symbolizes depression and death. 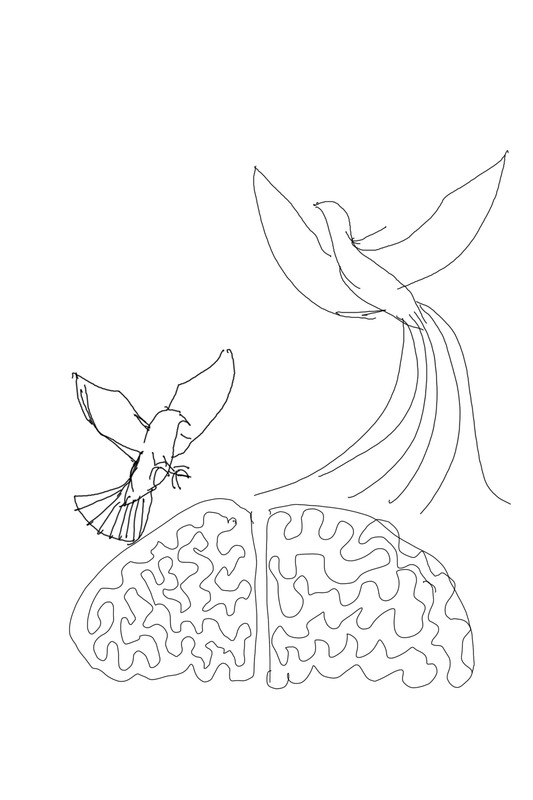 In this interpretation, both birds represent destructive, though opposing, forces. I love the symbolism in this sketch, and have set it aside for later development. However, I want something more upbeat as a first project, so I’m still looking. I think what I need to do is brainstorm a set of ideas/words around rebirth, and then use that set of ideas (perhaps with my Design Poker exercise) to brainstorm more images. I love Bluster Bay shuttles – they are beautiful and a joy in the hand – and I’m particularly fond of their Honex-tensioned end feed shuttles. So these are a welcome addition to my collection.